Jalopnik must apologize for our grave error last week, in asserting grid girls are not necessary—and even, possibly, harmful!—to racing. We were so very wrong because, as we recently learned from mediocre Formula One driver Nico Hulkenberg, male drivers need to see beautiful women in order to operate a car. We argued last Thursday that F1 potentially ending its use of grid girls would be a good thing, since having an entirely male race grid lined with women meant to adorn the surroundings and be looked at in an objectifying manner isn’t a good way to show young girls that they, too, can be integral components to a race team—drivers, engineers, crew members and the like. We said it perpetuates the stereotype of women being on the sidelines while men are the main show. When a member of that entirely male F1 grid, Daniel Ricciardo, said last week grid girls are cool and that he didn’t see “any downside” to having them at the track, we brushed him off. Silly ol’ Danny, we thought. He seemed better than that. He seemed like one of the good ones. Turns out, he was. He was right all along. 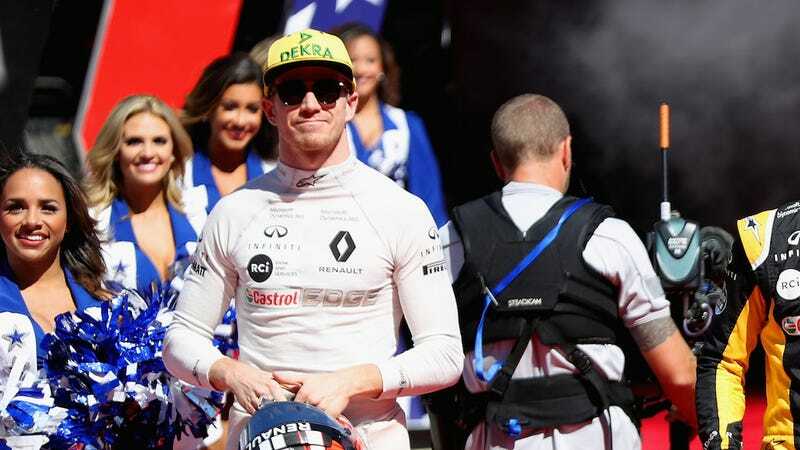 Mediocre F1 driver Nico Hulkenberg, who is highly allergic to pink, made it clear to German newspaper Bild that he and his fellow, typically less mediocre F1 drivers need these women on the grid before the races. Unlike Sabine Schmitz or Rosemary Smith, their high and mighty levels of testosterone do not allow them to properly pilot a car without being slightly aroused beforehand. “The grid girls must stay,” said Red Bull man Verstappen. His take was reflected by Renault driver Hulkenberg. “It would be a pity if they took the eye-candy from the grid,” he said. Thank you, mediocre F1 driver Nico Hulkenberg, for enlightening us to this true error we made in our judgement about grid girls. You need that “eye candy” in order to achieve such mediocrity, which landed you behind both of those icky pink cars in this year’s point standings. You were probably just trying to stay at a safe distance and not catch the diseases men get when they touch anything pink. Shame on us for trying to take those all-important grid girls away.